The Montreal author on writing his fourth novel, which is up for Canada's richest literary prize. Eric Dupont brims with passion and charisma when you speak to him. 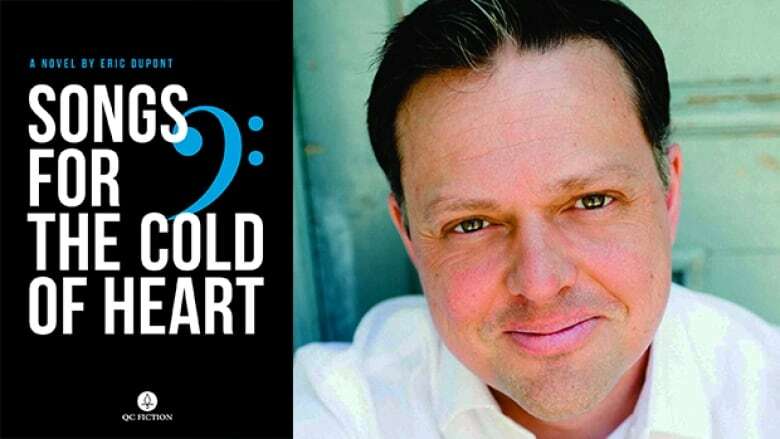 It's an energy the Montreal author, teacher and translator's infuses into his fourth novel, Songs for the Cold of Heart. Titled La fiancée américaine in its original French, it is a epic story, translated by Peter McCambridge, that spans historical time and place to tell a tale that weaves in multiple narratives, characters and life lessons. Songs for the Cold of Heart is on the 2018 Scotiabank Giller Prize shortlist and was a finalist for the 2018 Governor General's Literary Award for translation. Dupont spoke with CBC Books to discuss how he wrote the book. "The first notion I had for this book was an image of girl named Madeleine. It's the 1960s and she's on a Greyhound bus to New York CIty to get an abortion. I had this image, but I didn't know who she was. Had I known that, I might have stopped thinking about her, but I was obsessed. I was asking myself questions about how terrible things happen to nice people — and were they nice people in the first place? What if it's the total jerk who's the one to survive the plane crash, for example? "It made me wonder how terrible things can change people. I started getting even more curious of that girl because she was sent on a voyage that she did not want. I was trying to find similar stories and narratives of unwanted voyages. In creating these narratives that would intersect with each other, they had to be about people embarking on an unwanted voyage and are put in a 'Sophie's Choice' dilemma and situation." "An ideal writing day is when I get up to take a long walk outside — or on a treadmill at the gym — so I can argue with my characters while I walk. That wakes me up, gets my creative juices running — I think they call them endorphins nowadays. I write on a computer, of course, and in my home office. I write without music and completely sober. I do not write under the influence — there were too many characters in the book and I would have forgotten some! "Because I have a day job, I do not worry about daily word count. On a given day, I have specific images and actions running in my mind; I want to write to create that scene. That's the daily objective I set for myself, scene by scene. And of course there was a map! My office wall was covered with paper map to keep track of all the characters. Even with that, it's still about the best laid plans, of mice and men. I used the map to write the novel, which I then took to the publisher — just for them to tell me the book should actually start at page 142! Back to work!" "One thing I like about Madeleine is that I never have her right in front of you. To ensure the plotting always connected, I decided that we would talk about her, she would always be present throughout the book, but you only get to know her through the eyes of the other characters. "There's a part in the book where two sibling characters — the sons of Madeleine — exchange letters and I made sure in those letters they talk about her as much as possible. We would never lose Madeleine, and that she would never be out of the reader's sight. But you never get full frontal Madeleine." "Research can give you a lot of stories and I did a lot [of research] for this book. I did a lot of interviewing people who lived through the 1960s in Quebec — just listening to them writing down their answers using their anecdotes. I also took four years of classical singing lessons — I'm a baritone, apparently — and that's how I was able to find a repertoire for my character that was believable. These people are really singing things that are supposed to sing at the level they are at. "I then travelled to Europe, and I was doing research on East Prussia and I found a whole bunch of interviews with survivors from the war. These interviews were giving me story ideas which I then used in the book, such as the sinking of the transport ship Wilhelm Gustloff, all of these details were given to me by survivors of that event. "You have no idea what I went through in writing this novel!" Eric Dupont's comments have been edited for length and clarity. The winner will be announced on Nov. 19, 2018. Here's how you can tune into the broadcast.